Preoccupations in view of setting up a museum in the city Năsăud existed as early as the second half of the 19th century. On December 24th 1873 the vice-captain of the district – Florian Porcius, sends a letter to the director of the Superior Greek – Catholic Gymnasium from Năsăud announcing him about the decision of the District Representative Committee to set up in the District Năsăud a “Reunion of Science and Museum”. In this letter he appeals to the intellectuals of the city to register as members of the respective reunion. Because the idea to set up a Romanian cultural institution didn’t fit to the denationalization attitude promoted by the authorities of the Austrian – Hungarian Empire, the museum remained just a project. Still, the appeal made by Florian Porcius did not remain without result. As such, by the end of the school year 1873-1874, the library of the gymnasium received a donation of numerous books. To the department of natural sciences was donated the mineral collection of 1060 pieces of Knight De Manz; it will also get richer with the important herbarium of Florian Porcius. After a while, some of the important professors of the gymnasium decide the constitution within this school, of several exhibitions containing objects found by professors and students during archeological diggings or that were occasionally discovered by private persons and then offered to the school. These are the firsts attempts to put together in a documentary exhibition, values of Nasaud’s culture. After the Great Union from December 1st 1918, the discussions were restarted to set up the Nasaud Museum. In 1923, at the initiative of a group of scholars from Nasaud, led by Iulian Marţian, there was decided the setting up of the museum. For this purpose there is published a certification stating that the Ministry of Arts agrees to set up a regional museum in Năsăud, museum that was to be temporarily accommodated in one of the rooms of the Border High School „George Coşbuc” in Nasaud. There was made an appeal to the persons possessing books, manuscripts, drawings, paintings, coins, clay-vessels, old folk webs, instruments, folk-technique objects of any kind or any other objects willing to donate or sell to this institution. On the long run the enthusiasm settled, and starting with 1926 the objects raising action for the endowment of the museum is practically stopped. On the other side, one has to remind the setting up in 1924, at the initiative of Iuliu Moisil, Virgil Şotropa and Iulian Marţian, of the historical – cultural magazine Arhiva Someşană. In this magazine there was clearly stated the necessity of an extension of the research activity concerning the border area and of exhibiting and valuating the relicts of the past within a specialized institution. Things are moving towards a favorable solution after the election of Iuliu Moisil as president of Despărţământul Năsăud al „Astrei” (Astra of the District Nasaud). This, together with Virgil Şotropa, Iulian Marţian, dr. Alexa David and dr. Artene Mureşan made the decision to set up the museum immediately. In the afternoon of August 2nd 1931, the five mentioned earlier, gathered in the house of Major Iulian Marţian and decided the setting up of Nasaud Museum. For this purpose they donated to the recently set up institution, collections of documents, of manuscripts, of publications, diplomas, books and other museum objects, objects gathered along their lives, all of them, their private property. Iuliu Moisil states the purpose of the museum: „The purpose of this museum is to set up a center around which to group all those wishing to contribute to the study and exploration of our region out of different view-points: pre-historical, historical, touristic, of natural sciences, hygienic, scholar, agricultural, industrial, patriotic – in order to develop the population of this region the taste for history, literature, arts and science, to create and organize the necessary mentality for the cultural and economic rise of the region”. Following the appeal of the founders, the Administrative Committee of the Administration of Border Funds Nasaud approves in the same year 1931, the awarding of two rooms within the building of the former dormitory of „George Coşbuc” Gymnasium in Năsăud, in order to set up a museum and a library. After that, there began the manufacturing of the necessary furniture and the arranging of the firsts collections received of donations. In this building, the Museum will function until October 1st 1948. I. The library, possessing a greater number of books, most of them old, received as collections from different persons, majority professors. II. An archive rich in documents, manuscripts, correspondence about the history and representative persons from the region of Nasaud. III. Collections of different museum objects. IV. Portraits of leaders of the border-patrol and photographs. On February 6th 1932 there was laid the basis of the cultural institution Nasaud Museum, on this occasion the status of this institution is being drawn out. In order to increase the authority of the museum and in order to improve the functioning conditions, the founders insist to transform the institution belong to the state. Following the approach made by Iuliu Moisil, the General Direction of State Archives, in its decision no. 191198/1937, published in the Official Paper no. 269, sets up in November 1937 a Sub-Direction of the State Archives in the city Nasaud. c) the archives and the libraries of the border institutions and of the private persons in the county that will be deposited at this Sub-Direction. In the donation document made by the founders of the museum, there is stated that both the archive and the museum and the library that will be donated are not allowed to be alienated or brought to another place, but are to remain forever in the city Nasaud. The main publicity organ of the museum was the magazine Arhiva Somesana (Archive of the Somes Valley), appearing in Nasaud under the supervision of Virgil Şotropa. The retired professor Iuliu Moisil fulfilled, without any retribution, the position of museum director. During the hortyst occupation of Transylvania (1940-1944) and then during the folding back of the hortyst troops (during the fall of 1944), the collections of the museum were devastated, destroyed and even alienated by the foreign invaders. At the ground floor of this building, there was organized, after a year, in five spacy rooms, an exhibition with historic and ethnographic character. This exhibition will constitute the heart of the later museum, museum that, as state budget institution, will open its doors in the year 1950. The entire museum collection (that in the meantime grew richer after numerous private donations) will move in the year 1951 in the old building of „Şvardei”, where it still resides. 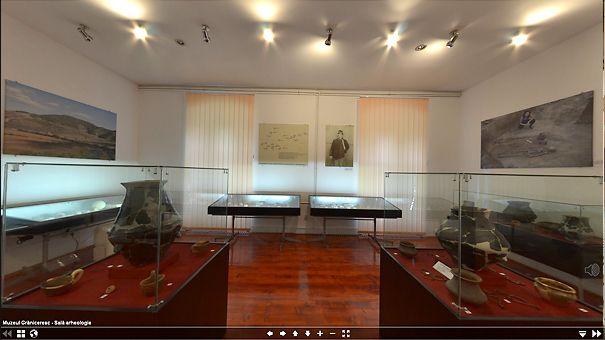 The first name was Regional Museum Cluj, then the Nasaud Museum and now is Nasaud Border Museum. Concerning the actual building of the museum, one has to mention that „Şvarda” is the former barrack of the II Romanian Border Regiment: a massive building that is historic monument. It was built, as Virgil Şotropa informs us, in the year 1770, year in which in Nasaud there was built the Roman-Catholic Church. Initially „Şvarda” had two floors. In the year 1815 the Aulic Council approves the tearing down of the two floors of the barracks because the walls started to crack and a collapse was imminent. Up to its transformation into a museum, the building functioned as a dormitory for the students of the Normal School. Upon request of the museums’ board, during the 1951-1954 and afterwards during 1961-1964, there were undertook workings both in the inside and in the outside of the museums’ building. The reparations continued after 1989 but, because of insufficient funds, the museum never entirely received the image it deserves. We still have to remind the period between 2001 – 2002, when the building of the museum underwent capital repairing, receiving after that a satisfactory aspect of the edifice. Starting with 2006 the repairing works were re-started, this time within a complex project meant to continue the repairing from 2001, but also envisaging the building of a new building for offices, a conference hall, a library and a room to deposit the archive of the museum (documents, files, registers). On the occasion of “Nasaud City Celebration” in May 2009, there was varnished the new ethnography exhibition of the museum in the presence of numerous guests from Nasaud County and all over the country. In 2010 there was ended the arrangement of the open air section of the museum, with ethnography character, in the back-yard of the museum. The section comprises a house (originating in the village Ilva Mare), a well with shadoof, a massive press for oil and must, a chariot, a sleigh, a gate of a village house and a milestone. The inauguration and the hallow of this open air section was made on December 9th 2010. At the same date there was varnished an exhibition comprising photographs obtained from glass-negatives from the collection of the museum. For the time being, the history section is being arranged, the exhibition will comprise archeological findings, objects of the II Romanian Border Regiment Năsăud (1861-1876), aiming at a varnishing in 2011. In the main yard of the Border Museum Nasaud, one can observe the bust of the teacher Vasile Naşcu, made out of bronze by the sculptor Corneliu Medrea, in 1967. The Border Museum Nasaud in collaboration with the History Faculty of Babeş-Bolyai University and the History Institute „George Bariţ” Cluj-Napoca edit the history and culture magazine Arhiva Someşană (Somes Valley Archive) – the yearbook of the Border Museum Nasaud. The first series of the magazine appeared during 1924-1940, when there appear numbers 1 to 28. One must observe that during inter-war period the magazine had a major contribution on the completion and sustaining the national culture. The second series of this publication, comprising volumes I to IV, appears during the communist regime during 1972 – 1977. Although censured by the authorities of the time, in the four volumes appear a number of valuable articles concerning numerous fields (history, ethnography, etc.). We have to mention that these four volumes are edited by Nasaud Museum. The problem of re-editing the magazine Arhiva Someşană after the revolution from December 1989, preoccupied both the members of the museum and intellectuals in the area of Nasaud. Unfortunately, the funds of the museum were insufficient for an editing of high quality of the publication. An attempt to re-edit the magazine was made in 2001, when there was published Arhiva Someşană New Series, no. 1 (29), edited by Border museum Nasaud and the Literary – Scientific Circle „Plaiuri maramureşene, năsăudene şi someşene” (Landscapes from Maramures, Nasaud and Somes Valley) from Cluj-Napoca. In 2002 there appears no. 2 (30) of this publication. But the real re-birth of the magazine starts in the fall of 2002, when there is printed the first number of the 3rd series (2002) of this publication, released on the Eve of our Lord’s Birth Day. It is being published, as magazine under the patronage of the Border Museum Nasaud and Babes-Bolyai University Cluj-Napoca. A new generation of historians and representatives of the cultural live of the region take over the task of their illustrious predecessors who set up the magazine. The yearbook Arhiva Someşană wishes to keep the orientation of the first series, from the view point of the content. This is why there appear articles and studies from different areas of study like history, ethnography, memory-writing, studies connected under numerous aspects the past and present of the county Bistrita-Nasaud. Besides these, in the magazine one can find studies of great interest within entire Transylvanian area. From the viewpoint of the shape and size of the magazine, it respects the exigencies imposed by the actual times. We should note that there appeared new numbers of this new series of Arhiva Someşană: no. II(2003), nr. III(2004), nr. IV(2005), nr. V(2006), nr. VI (2007), nr. VII(2008) and nr. VIII(2009).